It's that time of years again - ghosts and goblins and all that sort of stuff! So, what better time to get some paint going on some fresh sofubi? I managed to pull together a nice little pie of goodies - all of which will go live in the shop on Halloween - sometime in the morning (around 11AM EST I'm thinking... depends on how late I'm up here in Japan!). After NYCC and CCM! Only one UU left Standing! Hello people out there in the internets!!! 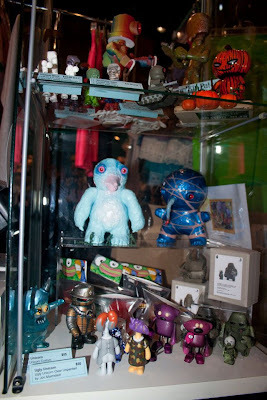 And some pics of the little blue guys in place at the con! Thanks to Kris Dulfer (Kid Ink Industries) for posting the pictures on Facebook! 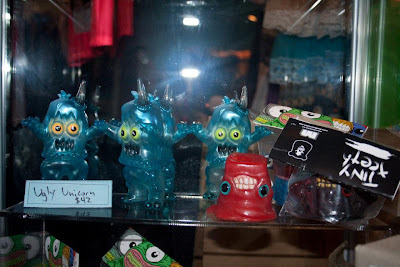 Awesome to see the Uglies in the company of such greats as Bob Conge's (Plaseebo) Molezilla! And then there were the pieces at the Cotton Candy machine in Brooklyn! 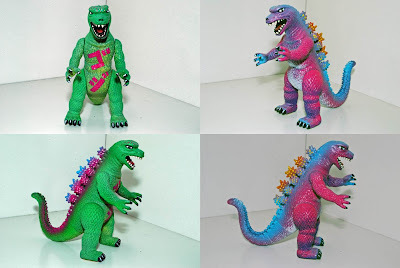 I was happy to see people postin pics around of these guys - and I really dig the pastel colors. Not sure how many there were (or how many went off to new homes), but here's a shot of one of the two variants. The other is just a switcheroo - blue legs and pink-ish top. I'll be getting some of these at some point, so keep your eyes peeled for updates if you want one but were unable to attend the SUPER COOL show at the CCM. So, things are moving right along here - still getting acclimated to the life of a 'very-little-japanese-speaking-foreigner-living-in-Japan'... :-) But it's all good! I've got my little studio all up and running, and I've been having loads of fun with my new Airbrush! I'm also trying to get in the swing of using some gouache paints - very cool stuff - very unique painting experience! 1)Tenacious Toys (Benny) will host a run of 10 Ugly Unicorns in booth 876 (along with Toy2R). 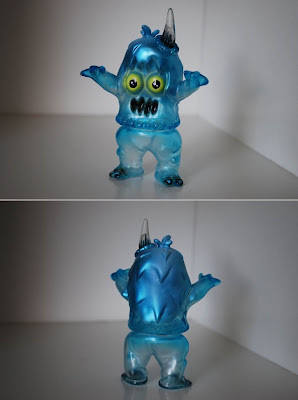 These guys have clear blue and metallic blue spray over top of clear vinyl! Super Fun to paint, and Great fun to photograph too! These will come with some signed and editioned screen prints for the header cards. $42 each - first come first serve - ONLY 1 PER PERSON! 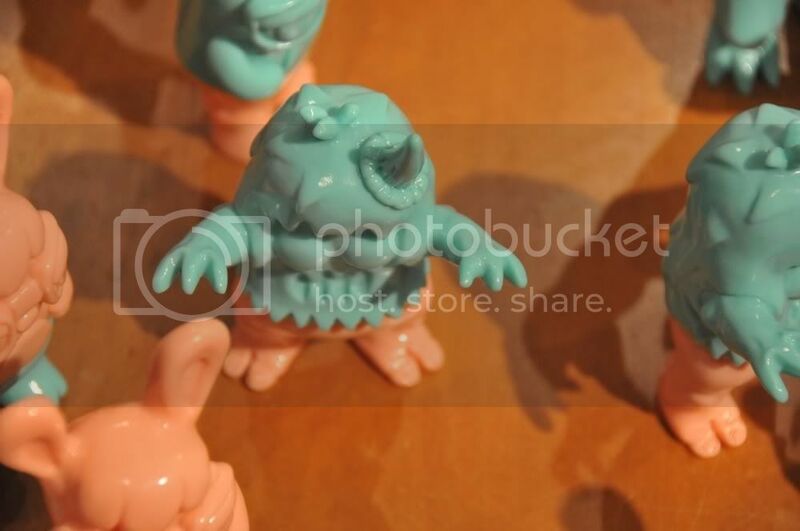 2)Lulubell Toys (Luke) will host a run of 5 Ugly Unicorns in booth 589. These guys have bright blue hair and some sleepy eyes over top of bright yellow vinyl, and they alse come bagged with editioned screen printed header cards! $42 each - first come first serve - ONLY 1 PER PERSON! In additon to the 2 mini-runs of UGLY, you might just find a custom one-off Ugly and one of the elusive crystal clear Ugly Unicorns (...I suggest looking at the Tenacious Toys Booth ;-). 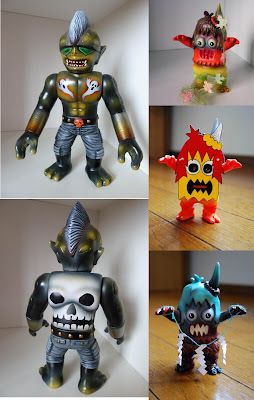 Benny will also have some other RAMPAGE TOYS goodies mixed in with his stuff, so have a look-see! There is also something in the works for an on-line release - maybe DURRING NYCC? If you are on the Ugly Unicorn mailing list, you'll be the first to hear the details, so feel free to shoot me an e-mail (rampage.toys@yahoo.com) to be added! Next up - customs and Fall/Halloween! And then, in November, is Design Festa at the Tokyo Big Site (Odaiba)! I'll be there with Datadub - and a bundle of Ugly Unicorns, paintings, and the like!